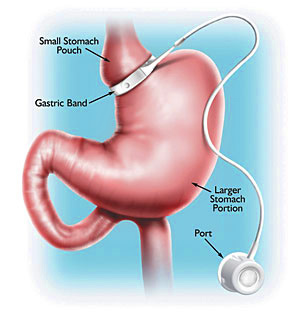 Also known as the iBand (imbricated gastric band), LAP-BAND® with Sleeve Plicationis the latest revolution in weight-loss surgery. This surgical technique combines the LAP-BAND® with the addition of sleeve plication. Rather than removing stomach tissue, the stomach is folded inward and sutured causing tightening throughout the length of the stomach. The sutures will eventually dissolve returning to it’s original size. But the LAP-BAND® remains in place allowing for lifelong adjustments as desired. In fact, this procedure is so new that outcome data is not yet available. The iBand is not covered yet by most insurance companies in the U.S. so our program does not yet charge an additional fee for placation when done with LAP-BAND® . Expect 1 night hospital stay. Return to work the following week. A band is placed around your stomach which can be adjusted by filling or removing saline through the access port under the skin in your abdomen. This creates restriction. The LAP-BAND® System was shown to provide 52-70% excess weight loss at 2 years. That translates into shrinking an average of 6 inches off the waistline and 6 inches off the hips. In a long-term study, severely obese patients lost an average of 60% of their excess weight 5 years after the LAP-BAND® System procedure. This technique involves no stomach amputation, cutting, or stapling. This is generally an outpatient procedure. You could expect to return to work within a few days if your job is not physically demanding.